This season, Cruise collections take a brand new stature. High end luxury houses have all chosen incredible architectures to show them and to spread their message all over the world. Here, it is no longer clothes that they are showing but more widely it's a DNA, their pith. Going to a foreign country is no longer enough. Now it's all about going to Places. Timeless places that have something to say. Thus, Chanel chose the Seoul Dongdaemun Design Plaza designed by Zaha Hadid. Next week, Dior will show its Cruise in Pierre Cardin's Palais Bulles in the South of France. 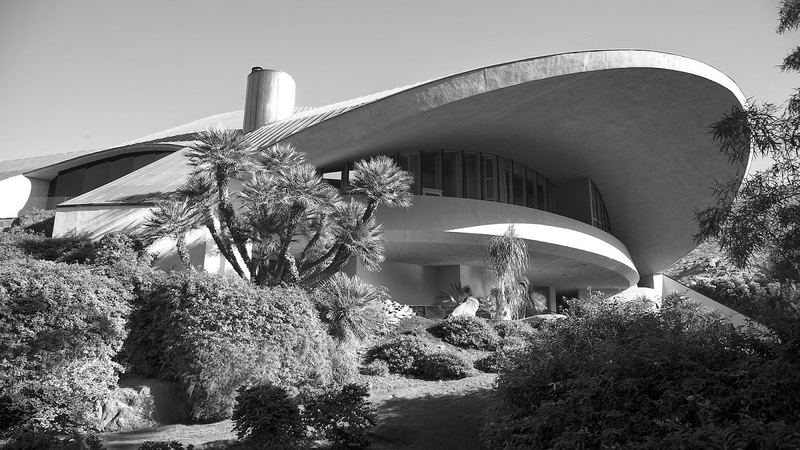 Louis Vuitton for its part opted for the Dolores & Bob Hope's outstanding house in Palm Springs. This place designed by John Lautner is a perfect match for Nicolas Ghesquière's editorial line: travel and Retro-Futurism. We always have to keep in mind that the Vuitton DNA is all about this idea of Travelling, the brand is first and above all a leather good maker. The building is made of concrete but there is a huge sense of lightness. It looks as if the structure has just landed here in the right middle of the Californian desert. A kind of spaceship that has brought life in its wake. A green oasis where you can breath and take a long quiet rest. Of course, we weren't among the guests but we watched the livestream and were absolutely flabbergasted by the place. It's as if the Lautner building had been designed for this show. The place is spectacular, magical so there was no need to add something more to it. 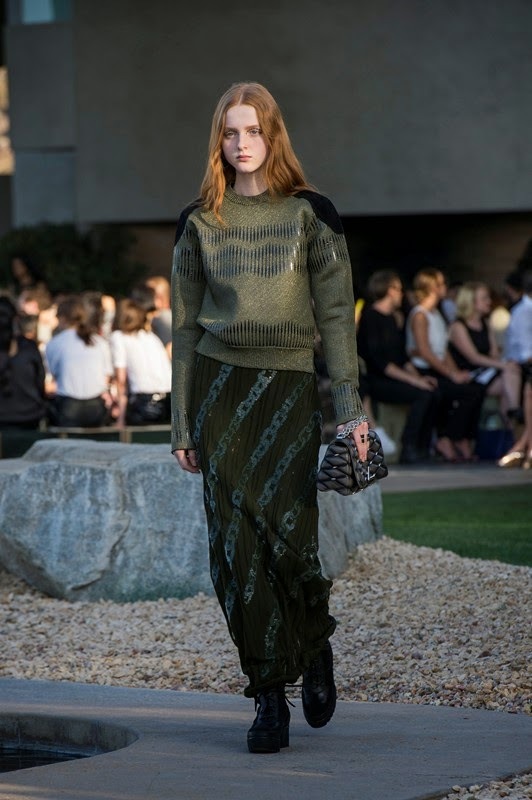 About his collection, Nicolas Ghesquière told British Vogue that he wanted to design "something long and with fluidity, this was very important for [him] to express this season". His goal was to show "a different attitude, effortless and cool, and with flat shoes and long skirts and a certain lightness of the fabrics". With this Resort 16 and even with the AW15 collection, the idea of 70s vibes has become a kind of shadow. It would be too reductive to qualify them as 70s. It's more about a hyper feminine woman but not about one particular woman. There's a sense of diversity making us say that the Vuitton woman can be every woman (only if she can fit in the clothes). Just look at the casting of models, from Fernanda Ly to Lineisy Monteiro, from Natalie Westling to Rianne Von Rompey, from Marte Mei van Haaster to Tamy Glauser. They are the New Ambassadors, the New Generation of girls. Desert warrior women wearing large cowboy belts like harnesses . It's a romantic and at the same time, a modern vision of truly independent women. The Resort 16 silhouette is a sporty one with boxy, cropped belted tops associated with long, long skirts. The wardrobe of this Vuitton woman is so diversified that we cannot define it as truly 70s. Her definition of beauty is a complex one. She is not afraid to match long, floating evening dresses with trekking boots or neo brogues. So what can be found in this wardrobe? It may be a complex and diverse one but the common point between all its pieces is the spirit of the times. 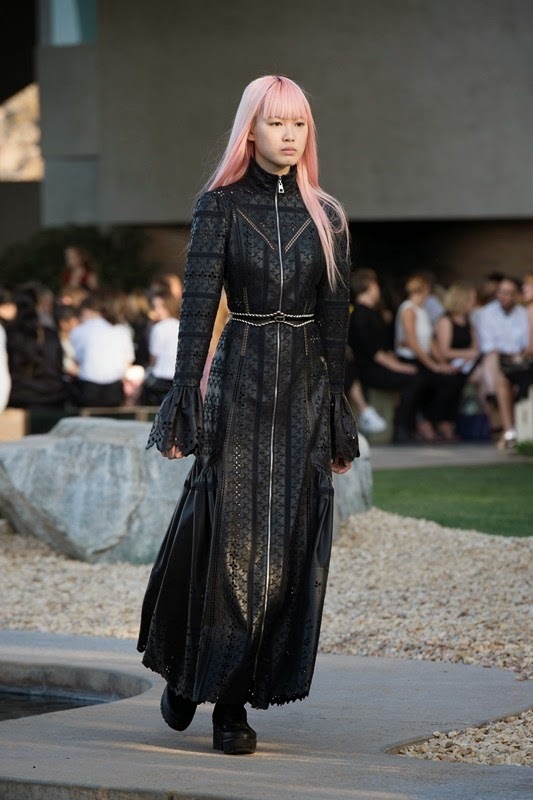 If the Game Of Thrones Khaleesi lives in our modern days, she could totally wear what the Vuitton woman is wearing. Because this wardrobe is all about an empowered femininity. 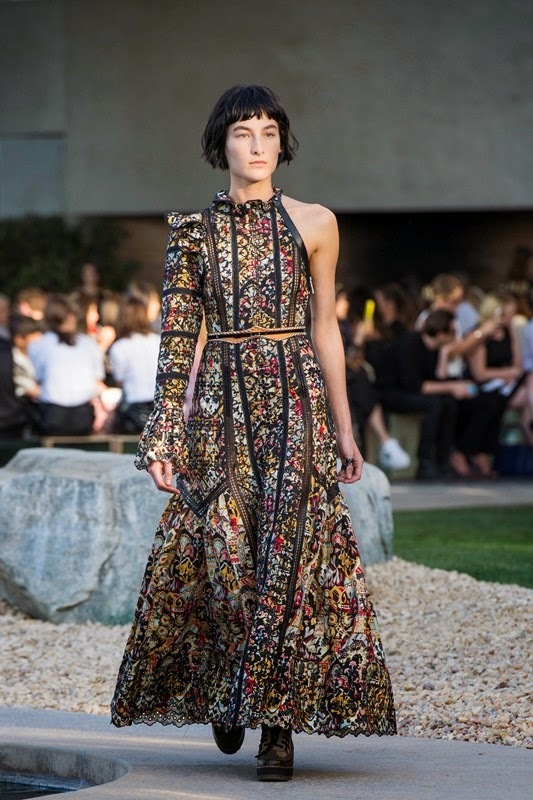 Floor-length silky dresses printed with chain patterns far from the idea of the usual prints one could find on this kind of dresses (flowers, naive prints...). We are obsessed with the heavy masculine belts used ad sleeves on the dresses or with the harnesses boxy shirts mixing a soft fabric with raw materials such as leather. We definitely love this idea of contrast in the silhouette. In this collection, nothing can be taken for granted, there's always a subtext, something more. Like the sweet provocation of the over the top jumpsuits with large cut outs on the waist and large clivages associated with cropped jackets. It's a diehard manifesto of an assumed femininity. Louis Vuitton is, first and above all, a savoir-faire and a lab tech specialized in materials on the edge of future. This collection is, in a way, the perfect window to show its métiers d'art and its experiments on the cuts, the fabrics, the shapes. It's also a kind of let go as if Nicolas Ghesquière had much more fun with the Resort collections than with the ready to wear ones (perhaps because he is not in the frozen frame of the Paris Fashion Week). Remember the last year's Resort presented in Monaco and the wonderful play on corals. There is a take on showstopper pieces just like the quilted coat, the neo Victorian dresses with the cut out details, the shiny crocodile skin fabrics displayed asymmetrically on a silky dress, the woven jumpsuit reminding us of the Louis Vuitton signature with the damier, the 3D knitwear tops or the extraordinary Navajo inspired pattern evening jacket mixing exquisite embroideries of snakeskin and sequins. This collection is all about jumping from one period to another. 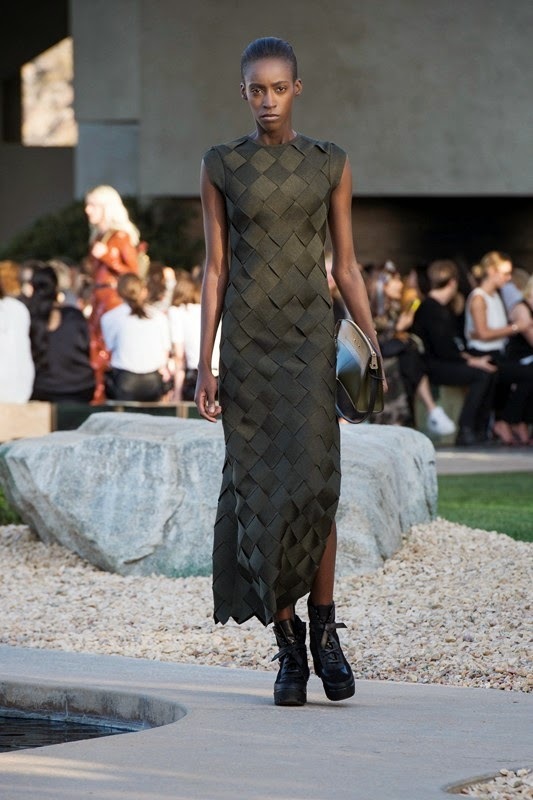 Thanks to Nicolas Ghesquière (only him can produce such a tour de force! ), the Vuitton woman is not a cliché. She may be from Palm Springs but her wardrobe is the reflection of her numerous travels while remaining very American (the sporty + Wild Wild West vibes). She is not frozen in one time and is expressing her modernity through "basics" of different periods. The biker jacket and the asymetrical collar shirts represent the 70s. The 80s are symbolized by the patent leather coat while the cropped bomber jackets stand out for the 90s. Only must have pieces that this Resort 2016 collection brings up to date. These pieces, just like a spaceship, make us travel, not only through space but also through time.